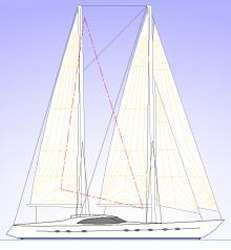 This design is a 39 metre (128 feet) SAILING YACHT that unusually provides three decks to give the equivalent accommodation to a similar sized motor yacht. All the onboard facilities of a super yacht are combined with the quiet and economical cruising of a true sailing vessel. Constructed from advanced composite or marine grade aluminium alloy, all the requirements of a discerning owner can be included. 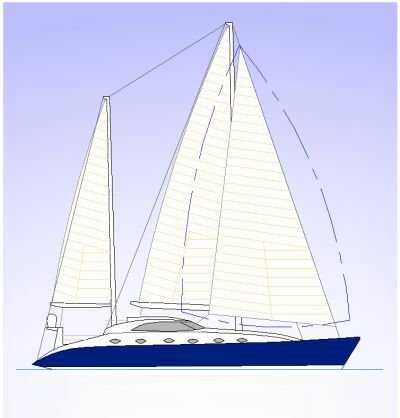 Designed for ease of handling and low maintenance, this yacht is optimized for a minimum permanent crew requirement. The accommodation can be arranged for spacious owner and guest cabins or for multi-cabin charter. Our design packages include working drawings that show comprehensive constructional details. 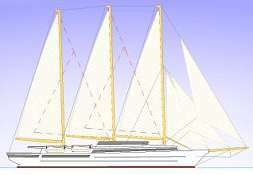 We believe that a competent shipyard will be able to build directly from our drawings without additional input. This ensures accurate cost and time estimates can be calculated and unforeseen expense for owner or builder can be avoided.